Born in Wichita Kansas, Trevor first was introduced to music at the age of 5 when his family put him in piano lessons. He learned from his teacher and mother who also played piano and sang, but never really established an interest in the instrument. Music in a way didn't impact Trevor until he was placed in his elementary school's Honor Choir at Bluestem Elementary. A year later he started playing percussion in the 5th/6th grade elementary school. Staying involved primarily with the glock and snare drum, an interest for marching percussion started to develop and fully blossomed at the age of 15. Trevor was involved in the top ensembles at Bluestem High School and attended state competitions all 4 years of his High School career in both singing and playing percussion. He started composing around the ages of 17 and 18, keeping musical thoughts in several composition journals. Once 18, he began attending Emporia State University, studying percussion performance and composition under the direction of Dr. Tracy Freeze and Dr. Andrew Houchins. 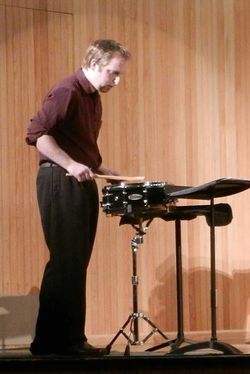 Trevor has performed in the ESU percussion ensemble, ESU Jazz ensemble, the Hornet Revue, the Emporia Symphony Orchestra, the WSU Wind Ensemble, WSU Symphony Orchestra, and Impulse Percussion Group, along with many others over the past 8 years, and performed at KMEA, as well as the Kansas State Day of Percussion. Graduating in 2017 from Emporia State, he began studies with the Principal Timpanist of the Wichita Symphony: Jerry Scholl, as well as the drum set play for Music Theater Wichita: Steve Hatfield, in pursuit of a Master’s Degree from Wichita State University. Trevor won first place in ESU's 2015 Honors Recital with Keiko Abe's Dream of the Cherry Blossom." Trevor has also performed with artists such as Dr. Christopher Whyte and Dr. David Constantine. This page was last modified on 10 April 2019, at 16:08.